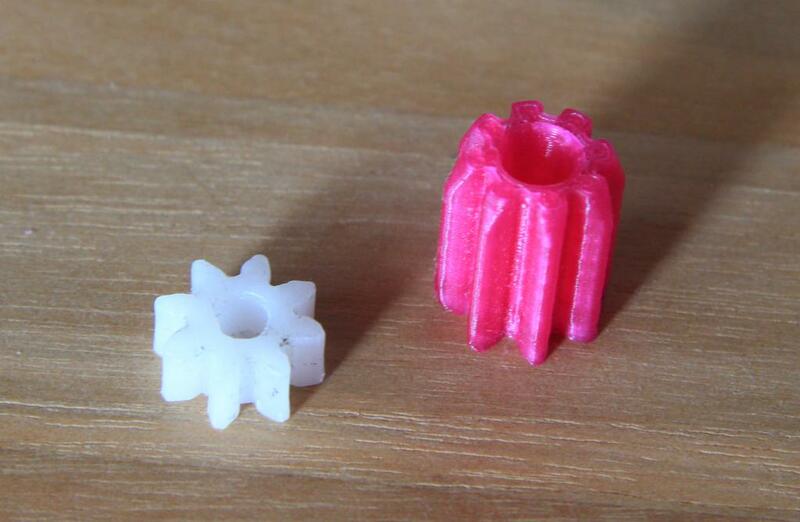 The small stock delrin gear on the feeder stepper motor got some freeplay with time. I first replaced it with one I found on thingiverse made by Chasmaker. You can download my derivative here. However, the PLA-printed replacement got loose because at one time my own filament feeder motor got very hot, so was its axis... ABS probably would last longer, but I do not use ABS. For me, it was the right time to give the free meshlab a try : I scaled the original STL file by 1.5 along the Z axis only. Meshlab really seems useful for this, but not for tweaking the design itself (I need to check meshmixer for this). For example, I did not find how to cut out the bigger and useless bevel on the gear. No biggie though, I could make it longer since my motor really has a long axis. I had to print it with an added overall scale of 1.05 because it was too tight otherwise to slide on the motor axis (I did not want to force it too much). I now have a king size small gear that will take much more time to wear out. By the way, I changed also the big gear replacement.